Summer weddings are all about being outdoors and enjoying the beautiful sunny weather. However, when temperatures rise too high wedding guests start to become antsy and annoyed. In order for you to have your picture perfect wedding and also keep your wedding guests happy and feeling fabulous, we've compiled a list of must have items to provide relief against the sun! Not only will your guests thank you later, but you'll also be able to enjoy yourself as a couple, knowing that your guests are relaxed, refreshed, and comfortable. 1.) Sunglasses: You don't want your guests squinting while you walk down the aisle in your gorgeous gown, so keep sunglasses for them to wear while outdoors. You'll be surprised to find how many people forget to bring shades to an outdoor wedding. Not to mention, they're also great photo booth props! 2.) Parasols: These are great stylish and useful accessories to keep for any outdoor wedding. They will keep away the sun, and will look great in pictures as well! If you want to get fancy, you can choose different colors or prints to match your decor. 3.) Flip-Flops: Whether you're having your wedding on the beach, or just want your guests to be comfortable on the dance floor, having flip-flops is a great idea! You can keep them in a basket or box with a personalized title like the one below. 4.) Personal Fan: Keep hand-held fans on each chair. Fans can also double up as your wedding program, which all your guests can keep as a personal memento after the wedding! 5.) Wet towels & Fresh spray: No one wants to feel stinky and sweaty at a wedding, especially since everyone will be dressed in their best outfits. 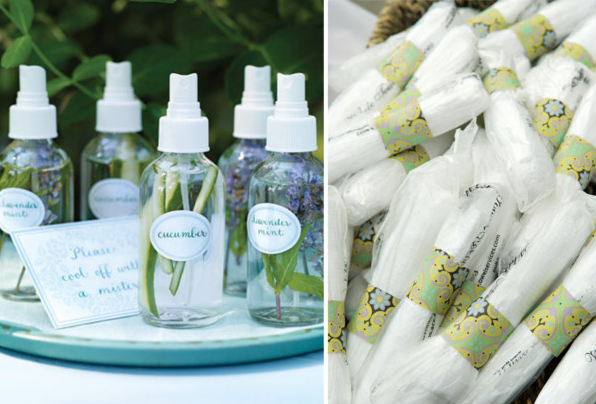 Having cool towelettes and fresh cucumber and lavender spray is another excellent way to make sure your guests stay cool and refreshed at your wedding! 6.) Cold Refreshments: Keep cold water bottles and lemonade in ice buckets, so guests can get hydrated before sitting in the scorching sun for the ceremony. You can also personalize each bottle with a message. 7.) Sunscreen and Bug spray: With hot weather comes those annoying buzzing bugs. 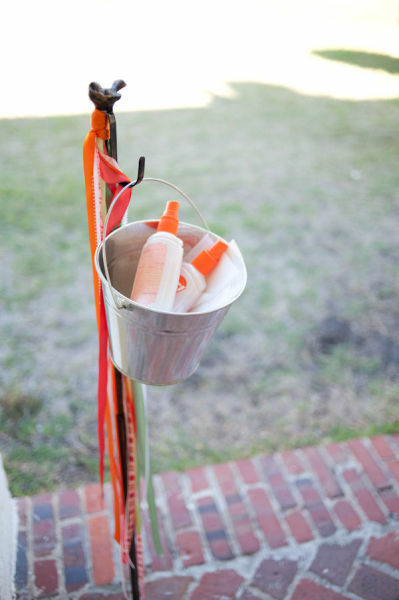 Be prepared by keeping a bug spray and sunscreen station for your guests to go and apply some much-needed SPF! Opt for cream instead of spray, so guests don't accidentally spray the food or their eyes. Remember to remind your guests that your wedding will be outdoors, so they can dress accordingly. Try and keep a shaded spot where people can mingle and catch a cool breeze, and stay away from metal chairs. This might seem pretty obvious, but sometimes we forget the minor details when planning. All in all, enjoy yourself and everything else will fall into place!